Kim Jong Un of North Korea is known for killing his top officials in brutal, even comic-book supervillain fashion: flamethrower, mortar, anti-aircraft gun. A United Nations commissioner on human rights in North Korea likened the Kim regime’s treatment of its citizens to that of the Nazis. Lately, the rotund communist leader has grabbed headlines for advancing North Korea’s nuclear weapons program with the apparent intent to test another device and the intercontinental ballistic missiles that might carry it. Kim, who reportedly loves other risky activities like driving sports cars and chain-smoking, may have been acting out of sheer impudence. After all, the new Trump administration could be more bark than bite. And communist big brother Beijing can often be counted on for support. Such notions, if ever entertained by Kim, were exploded in the wake of the Florida meeting and a second phone call between Donald Trump and Xi Jinping. A U.S. naval battle group led by aircraft carrier Carl Vinson is now in the vicinity of North Korea. Trump tweeted that the United States will go it alone in handling a North Korea “looking for trouble” if China abstains. But Xi doesn’t seem like he is shirking away from getting Kim to back down on nuclear. Chinese troops are reportedly on alert near the Korean border. The Chinese regime has turned back ships carrying North Korean coal from its ports in accordance with U.N. sanctions. The nationalistic Global Times warned North Korea that “Chinese society” could be in favor of U.N. sanctions like the restriction of oil imports. Kim Jong Un appears to have gotten the memo. 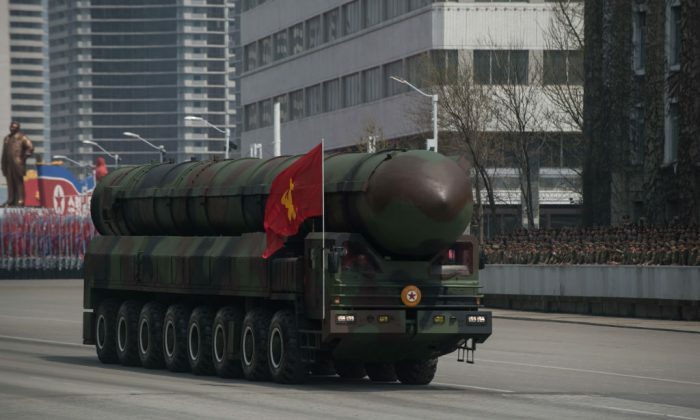 Despite reports of a planned possible nuclear test on the 105th birthday anniversary of founding leader, and Kim’s grandfather, Kim Il Sung, Kim III instead held a military parade showcasing three long-range missiles. It is unclear whether Kim will soon bluster into another round of brinkmanship. But the odds of his leadership surviving another escalation aren’t encouraging, given that Trump and Xi appear to have reached an understanding on how to handle the country. Trump’s authorization of a Tomahawk missile strike against Syria seems to show that he will go hard on rogue regimes if the circumstances demand it. Xi will almost certainly not back the Kim leadership, which has long been close to the rival political faction in China headed by former Chinese leader Jiang Zemin, and appears to be more trouble than it is worth. If Kim crosses the red line, a scenario could unfold in which the United States and the Chinese regime both seek to neutralize the Kim leadership. Such a scenario, however, might be complicated and very risky—all North Korean officials loyal to Kim and those in charge of nuclear weapons must be taken out in one fell swoop, and they must be replaced by officials who would be amenable to China under Xi. Failure in this operation will almost certainly lead to war (and because nuclear weapons are involved, this carries enormous risks). The ideal situation for all sides would be for Trump and Xi to bring Kim back to the table for multilateral talks on North Korea’s nuclear program. Kim would be forced to make concessions in exchange for food and energy assistance; Trump would earn a diplomatic stripe; and Xi could ensure that his political rivals would be hard-pressed to undermine his leadership through a reckless, nuclear-enabled North Korean regime.